The Bijou wall light LED with Flex Shaft by Fabbian is always there when a flexible illumination for reading is required. Thanks to the flex shaft, the light of this luminaire may be precisely focused as desired. This luminaire may take different shapes. The picture shows the cylindrically shaped lamp head. There is also a cone-shaped version available. Thanks to its flexible arm, the Fabbian Bijou wall light LED with Flex Shaft always directs the light to where it is required. If the light is installed close to a bed, the flexible arm of this wall light turns out to be a real blessing whenever you want to read something while lying in your bed. Then, the Bijou wall light LED with Flex Shaft by Fabbian ensures that focused lighting is directed onto a book, the newspaper or a magazine. Additionally, its focused illumination prevents the eyes from tiring too early – this means that an untroubled time while reading is guaranteed. The Fabbian Bijou wall light LED with Flex Shaft also does a good job as a reading light next to an armchair or a sofa while it supplies warm-white, focused light. If the desk is located close to a wall the Bijou wall light LED with Flex Shaft also provides for comfortable working conditions. 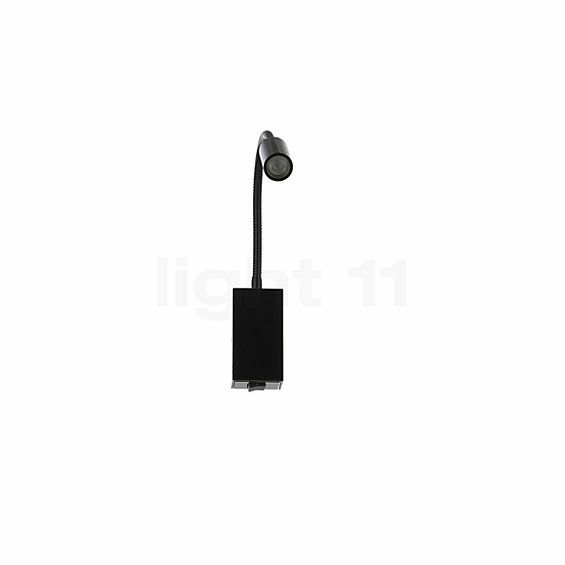 Depending on what you prefer, this luminaire is available with two different light heads: the cone-shaped head emits the light at an angle of 30°, while the cylindrical head emits the light at an angle of 40°. The Bijou wall light LED with Flex Shaft by Fabbian was designed by Prospero Rasulo. The Italian designer did not only attach importance to flexibility but also to an elegant appearance. Here, the straightforwardness of the angular, square-shaped housing and the smoothness of the light arm are combined to form a harmonious unity. After all, the Fabbian Bijou wall light LED with Flex Shaft does not have such a name for nothing: "bijou" is the French term for "jewel" or "gem". A white or black lacquered or a glossy chrome-plated surface elegantly rounds off the overall tasteful impression. But these are not the only advantages offered by the Fabbian Bijou wall light LED with Flex Shaft. Thanks to an integrated modern LED, this elegant wall accessory only requires 1 or 3 watts for producing its adjustable zone light. A transformer is also included in the scope of supply. The Bijou family includes further wall lights, pendant lights as well as floor lamps – these are also available in our shop. Nice spotlighting for reading on your bed. 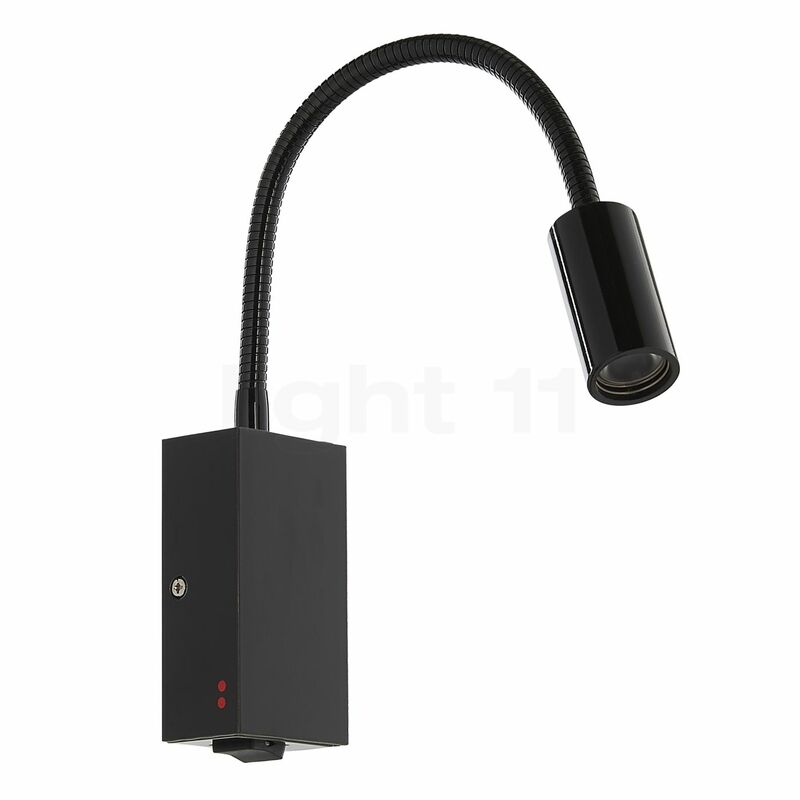 Tell other customers and us about your experiences with the Bijou Wall Light LED with Flex Shaft !